ALTOONA, Pa. -- In one of the first such large-scale moves by a major gasoline retailer, Sheetz Inc.--a leading convenience store industry player--has announced that it will offer an E15 fueling option to its customers in North Carolina by early 2016. As reported in a 21st Century Smoke/CSP Daily News Flash, the convenience store and gas station chain will begin to install the new E15 fuel option in early 2015, and by spring of 2016, installation should be completed at 60 convenience stores in the Tar Heel State. E15 is a combination of 15% ethanol and 85% gasoline and is a higher-octane fuel. The Environmental Protection Agency (EPA) approved the fuel in January 2011 on vehicles built after 2001. Sheetz said ethanol burns cleaner and cooler in engines, which helps with the performance of the vehicle, while also considered better for the environment and priced competitively to conventional gas options. "We are known for being pioneering in our industry and are always looking for ways to give our customers the best product available on the market," said Michael Lorenz, executive vice president of petroleum and supply. "E15 is another way for us to give our customers a new alternative fuel option." El Dorado, Ark.-based Murphy USA and Brentwood, Tenn.-based Mapco Express are among the other major retailer that have also announced E15 rollouts. E15 is controversial, however, and many retailers have been slow to embrace it and the expense of installing it. The debate over the fuel blend continues, and many fuel and automotive industry experts believe that despite EPA approvals, E15 still has the potential to damage engines, especially because consumers can easily confuse it with other fuels. 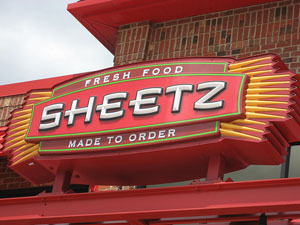 Altoona, Pa.-based Sheetz, with more than $6.6 billion in revenue for 2014, operates more than 489 convenience stores throughout Pennsylvania, West Virginia, Maryland, Virginia, Ohio and North Carolina. It provides a menu of Made to Order (MTO) subs, sandwiches and salads, which customers order through touch-screen orderpoint terminals. Which Retailers 'Passed,' 'Failed' on E15, E85?